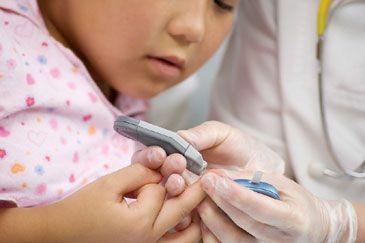 What are the risks of diabetes in children? The frequency of diabetes is rising around the world, and studies are showing children are at increasing risk of developing the disease. About 350 million people worldwide have the illness, a number likely to more than double in the next 20 years. Over time, diabetes can damage the heart, blood vessels, eyes, kidneys and nerves – causing chronic problems and early death. Type 1 diabetes (sometimes called insulin-dependent, juvenile or childhood-onset diabetes) occurs when the pancreas does not produce enough insulin, a hormone that regulates blood sugar. The cause is not known, but it is thought to be the result of a combination of genetic and environmental factors. Many countries are documenting higher numbers of newly diagnosed cases of type 1 diabetes, particularly in younger children. Interestingly, some disease patterns among children resemble infectious disease epidemics. Currently, there is no known way to prevent type 1 diabetes. Type 2 diabetes (sometimes called non-insulin-dependent or adult-onset diabetes) happens when the body cannot effectively use the insulin it produces. Often preventable, it can result from excess body weight and physical inactivity, and sometimes, a genetic predisposition. Recently, type 2 diabetes has increasingly been reported in children and adolescents, so much so that in some parts of the world type 2 diabetes has become the main type of diabetes in children. The global rise of childhood obesity and physical inactivity is widely believed to play a crucial role. Healthy eating and lifestyle habits are a strong defence against the disease.